Huge Savings Item! 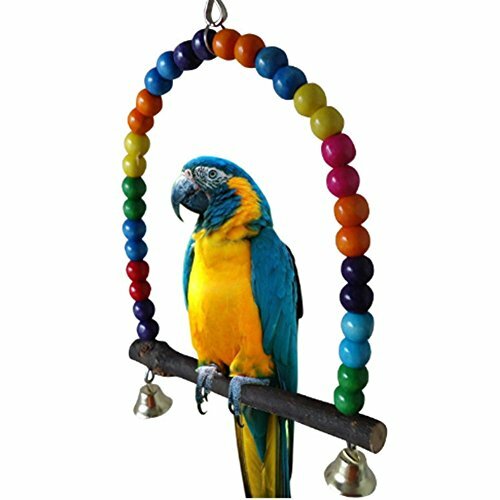 Save 19% on the LIANCHI Small or Large-Sized Parrot Toy Pure Natural Colorful Bead Cage Parrot Chewing Toy (Large) by LIANCHI at Pet-O-Institute. MPN: 9896596. Hurry! Limited time offer. Offer valid only while supplies last. Festures: Materials: Wood+ Chains leather rope +Plastic cuff links 1.Suitable for all kinds of large, medium and small Parrots all over the world. 1.Suitable for all kinds of large, medium and small Parrots all over the world. Senegal parrot,agapornis fischeri,cockatiel, psittacula alexandri,pionites,lorikeet etc. 3.Notice: All kind of parrot /birds toys made natural food coloring and material. The food coloring fade is normal, all of toys we can guarantee safety and heathy for parrots /birds use. Pure natural wood parrot toys, especially hard bite, color for edible pigment, food grade pigment, safe and secure. Climbing toys, bell parrot toys, prevent parrot bite hair, bright wood color, parrots gnaw bite and enjoy it. Small and Large-sized parrot swing toy, large parrot chew toys, pet bird cage accessories toy and swing bridge, let the birds increased exercise, muscle strengthening, play more fresh. Small and Large-sized bird of the parrot toys, pearl bird toys, colored parrot climbing ladder toys suitable for: small sun sun Keck monk Jardine ceiling honey ash machine sunflower Amazon etc. If you have any questions about this product by LIANCHI, contact us by completing and submitting the form below. If you are looking for a specif part number, please include it with your message.